She did it and she couldn’t be more proud. And I couldn’t be more proud of her. And my niece too. I have been blessed with two strong little girls to love. Strong as in, determined and strong as in they could easily take me down in an arm wrestling competition without breaking a sweat. 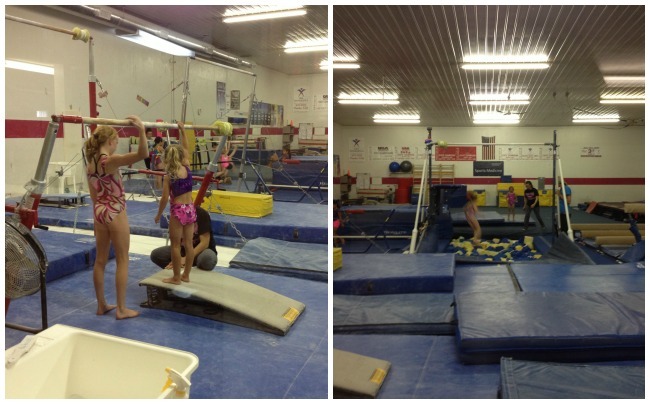 My niece is a competitive gymnast. An amazing one. My daughter looks up to her and mimics everything she does. From the way she wears her hair to the clothes she chooses, to the sport she dreams of doing one day. In fact, Avery keeps a photo of her cousin leaping across a balance beam on her dresser. “I do that too, right mummy?” she’ll say as she points to the picture. A few weeks ago when we were visiting my niece and family, Avery got her chance. She wore a leo that her cousin gave her under her clothes all day, waiting excitedly for 3:30 when we would be heading the the gym. Avery sat in the viewing room and watched as her cousin and her teammates finished their practice. Four hours a day, four days a week they train. I sat with the other “gym moms” and watched in awe as the girls went through their paces. As each minute ticked by, Avery got more anxious for her turn, “Gymnastics now?” she asked repeatedly. Finally class was over and Avery’s cousin came to get her. I wasn’t quite prepared for what happened next. My pint sized powerhouse tackled each piece of equipment with a mixture of grit and sheer joy. One of the moms in the room said, “Wow. Just look at her…at how happy she is.” Well that was enough for me. I started to cry. The red blotchy faced snotty kind of cry that you can’t hide, even if you tried. Teammates gathered around Avery and cheered her on. And the coach was there to show her the ropes and keep her safe. I thanked her but I’m sure she has no idea how much it meant to us. A little girl who wanted to soar, got her chance. We’re signing Avery up for gymnastics this fall. And this kid is going to fly.